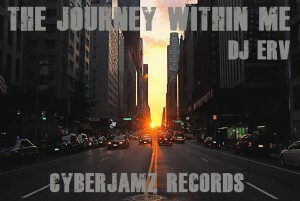 Slammin E.P Alert - Journey within Me - DjERV. Slammin E.P Aert: ?Journey within Me? ? DjERV. ? coming soon to Cyberjamz Recs..
Ok hold up.. hold up ! Brother Erving Batista (DjERV) has been sneeking around the lab these last few months and with good reason.It?s the creativity in us that make us and someone like producer DjERV deliver this kind of package to our label. Let me add that the grooves and vibes offered in this ?Journey within Me? E.P package are a reflection of this producer as to where he has been, where he is now and where he will be in the future. All 3 of those expressions are transparent in this package. DjERV kicks it off with ?Deep inside my Flow? ,a deep musical ,syth driven cut with some tasty keyboard and drum work to make this a favorite.The journey continues up next with ?Dummatic State? (love the title),which is a dope afro-drum track with lovely keyboards and percussion that make this another favorite for me off this hot release and as if these 2 gems weren?t enough.. he had to go travel musically into a special place with ?Joyful Ride? , a slamming straight thumpin? beats and synths jam with lovely keyboards layed out proper throughout the cut? NICE !! ..Let me continue on this Journey within DjERV by bumping into the next number which is a tasty piece entitled ?Mr.Techy?s Trip? a unique 4 to the floor house music thump-n-grid jam dedicated to all dancers.This cut is nice and right on time for those Spring/Summer Parties we all love. To end this magnificent musical ride ,DjERV closes out with ?Raw Journey? (DjERV Bass Mix), which is a heck of a way to close out any E.P, a wonderful piece with raw 808 Style rhyms and grooves with added drum kicks to match,this one is a true look into DjERV?s live and musical journey.. a look into his future and yes? this is another favorite of mine. I must say this ?Journey within Me? debut E.P by DjERV for our Cyberjamz Records label is a true gem and definitely falls under the category of keepers to have in your music arsenal. What a lovely ?Journey within He? this is.. This E.P gets a 9 of 10 on the Soul Scale of Music.